Ardie Dean Strutzenberg, a Humboldt native, is the newest member of the Iowa Blues Hall of Fame. Ardie Strutzenberg, right, is pictured with Bryan Church when the Humboldt native was inducted into the Iowa Blues Hall of Fame. HUMBOLDT — He bought his first drum kit for $15 at a Fort Dodge pawn shop with money he saved mowing yards. Now, after more than 50 years as a drummer with some of the biggest names in music, Ardie Strutzenberg is the newest member of the Iowa Blues Hall of Fame. 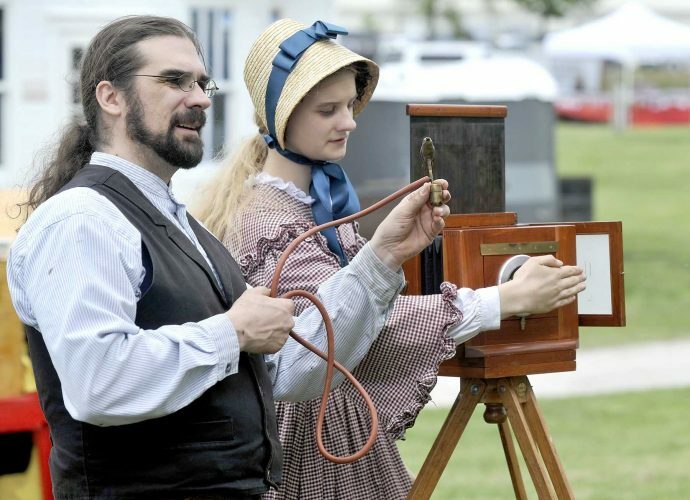 The charismatic Humboldt native has played all over the world — Europe, Australia, South America, even Carnegie Hall in New York –but his love for his hometown roots remains as true as his drumbeat. The way he tells it, Ardie didn’t choose to be a drummer; drumming chose him. One night when Ardie was 12, a family friend who had spent too much time at a downtown bar stopped by the Strutzenberg home and asked Ardie and his friend, guitarist Ed Lindsey, to play him a song. They did and the man gave them each $2. “Now you’re professionals,”he joked. Ardie was so taken by the idea of being paid to play music that it wasn’t long before he and Lindsey teamed up with John Callahan and the late Mark Flanagan to form his first band, Blue Condition. Ardie played throughout high school with Callahan, Flanagan, Jon Porter and Randy Berka as the Lazy River Band, and later with Callahan, Flanagan and John Brandsgard as Goo. Depending on the personnel, they played everything from contemporary Top 40 to heavy album rock. Ardie left Humboldt and played some high voltage rock in the Twin Cities, then some western swing and rhythm and blues in Kansas. He was learning to play all styles of music. But it wasn’t until he landed in Nashville that he had his blues epiphany. So Ardie joined up with Chicago Charlie, then later with another old blue artist named Homesick James, who had been part of the Chicago blues scene in the 1950s with legends like Howlin’ Wolf. 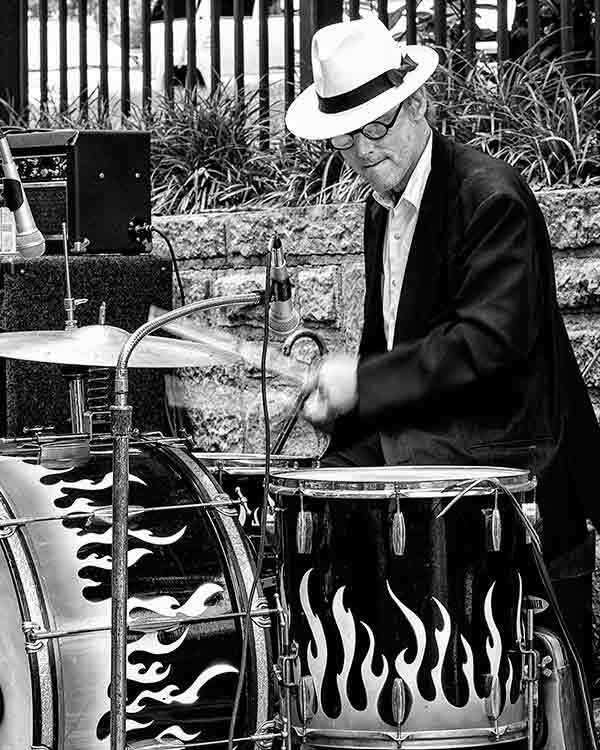 James loved the way Ardie played drums and soon Ardie was playing prestigious gigs throughout the country. His blues career had taken off. Well, sort of. Ardie gained notoriety as a blues drummer and became a regular session man in Nashville studios. He estimates he’s appeared on at least a hundred, “maybe 200,” blues albums in his career. Then in 1999 he met and began playing with the man he calls his mentor — blues legend Taj Mahal, a 10-time nominated and three-time Grammy winner. 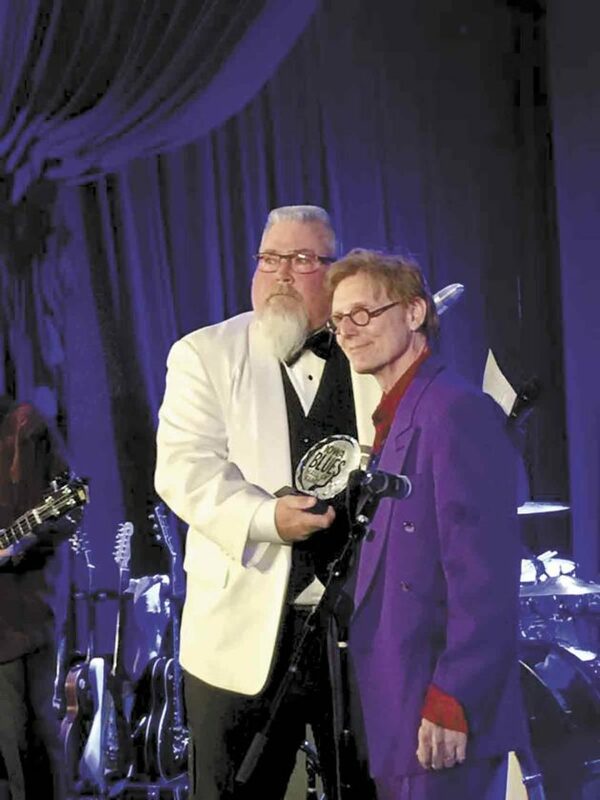 Ardie has been inducted into the Kansas Music Hall of Fame and the Alabama Blues Hall of Fame. When he learned of his Iowa Blues Hall of Fame induction and that he would get to perform at the ceremony, Ardie needed to assemble a band. He had his pick of dozens of blues players he had worked with over the years, many of whom preceded him into the Hall of Fame. But his first call went to his former high school bandmates — Berka, Porter and Brandsgard — and they jumped on board in a heartbeat. Along with Callahan and Flanagan, Ardie and his bandmates have returned to Humboldt to play a number of reunion dates over the years and have donated the proceeds of their concerts to several Humboldt nonprofits. It’s the highlight of every Humboldt performance when Ardie stands up and plays his drums as he circles his drum kit, never missing a beat, a master showman at his best. As his band closed its set at the Hall of Fame induction, Ardie brought out his niece Courtney Flournoy to sing the final song, Freddy King’s “Same Old Blues.” Her beautiful, young voice captivated the crowd. Like Ardie said, carrying on the blues tradition to the next generation.